Being a sewer is amazing! 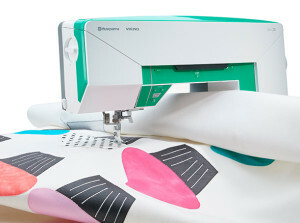 The JADE™ 20 sewing machine, available at West Side Sewing, has many great features making it perfect when you want to create a space that is uniquely yours. If you are in Cedar Rapids, Iowa or the surrounding area, visit our store to learn more about the Designer Jade 20. Sew large home decoration projects, quilts or garments easily thanks to the large area to the right of the needle, 200mm (almost 8″). The sewing space is the largest compared to most other sewing machines at this price point. A Sewing Guide is conveniently located in the lid. Just find the fabric type and the sewing technique and it will tell you the perfect stitch and settings to use to achieve the best results. The sleek modern design looks stylish and hides all the included accessories, even the foot pedal. 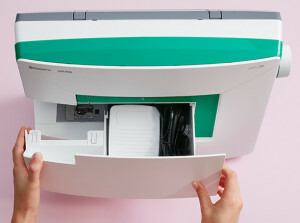 There’s no need to hide your sewing machine in a cupboard. Sew without the foot control for easy, consistent speed. 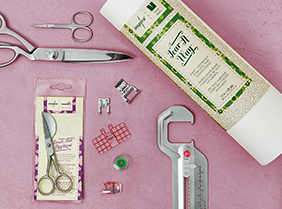 This function is great for sewing decorative stitches, long seams and winding a bobbin. It is also ideal for sewers with physical limitations. 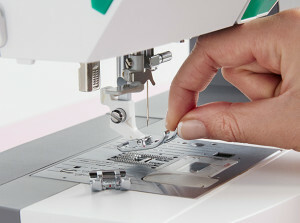 Your HUSQVARNA VIKING® JADE™ 20 sewing machine features more than 80 beautiful 7mm wide stitches. From quilting to decorative sewing, your creative options are endless. 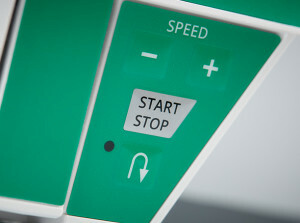 A wide selection of easy snap-on presser feet are included with the HUSQVARNA VIKING® JADE™ 20 sewing machine, including the One-Step Buttonhole foot. The possibilities are endless! 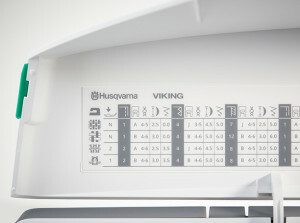 HUSQVARNA VIKING® features the largest assortment of optional accessories and presser feet for every sewing need and creative possibility. With the press of a button, you can easily determine the right presser foot for the selected stitch shown on the LED display. 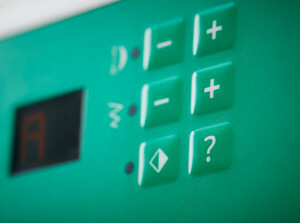 By pressing the SPEED plus or SPEED minus buttons, you can easily adjust the speed to your comfort level. 7 HUSQVARNA VIKING® original snap-on presser feet included. 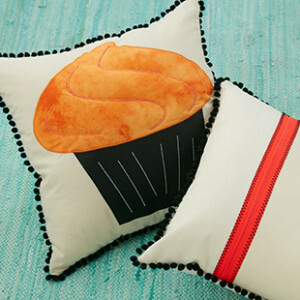 What would fit better in the kitchen of a baking enthusiast than a 3D cupcake cushion? 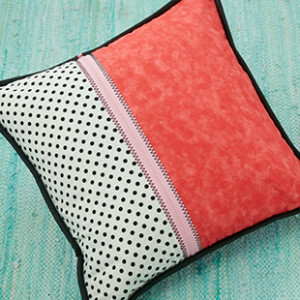 Create this sweet cushion with some fabrics, pom-pom fringe, batting and the fun optional Braiding Foot. Frame your project and make it into a large wall hanging. 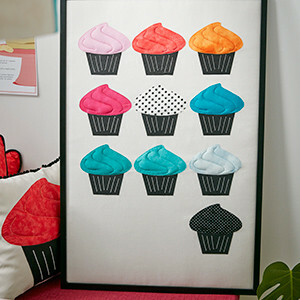 This cool, poster sized wall hanging is covered with 3D cupcakes, which are easily done as appliqués. Plain ordinary curtains are easily upgraded to unique and by adding pom-pom fringe along the edge. On a purchased top, open up the bottom of the sleeve and embellish the cuffs with your favorite decorative stitch, then sew your sleeve back together! 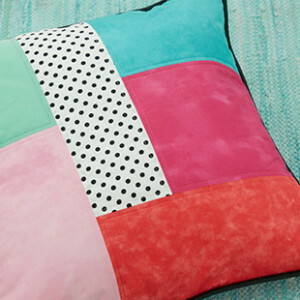 With different size pieces of fabrics this patchwork cushion has a playful appearance. The colorful front is finished off and framed with black piping. On this cushion, the heavy zipper is the eye catcher. The zipper is made as a decorative detail, stitched to the front piece with a reinforced zigzag stitch. 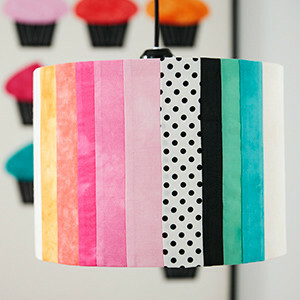 With strips of fabric scraps you can create this rainbow lampshade. Alter the width of the strips for a more random effect. 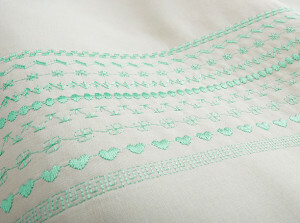 82 stitches including Utility, Quilting, Decorative stitches and 5 Buttonhole styles.